Neck stiffness is a common problem for many people. Sitting in front of a computer at the office for 40 hours a week has left many of us with chronically stiff necks. The following three exercises will help you relieve the discomfort of a stiff neck. And if you do them on a regular basis they may even prevent future neck pain. Most office workers have stiff and immobile thoracic spines. The Thoracic Spine is made up of the 12 vertebrae below your neck that connect with your ribs. If you thoracic spine is in a bad position it can cause your neck to become stiff. This rib mobility exercise will help keep you thoracic spine flexible. Lay down on the floor on your back with your knees bent and feet flat. Slip a lacrosse ball or a tennis ball underneath your first rib, the ball should be in between your spine and right shoulder blade. Extend your right arm and reach it up and back over your head so that the back of your hand is resting on the floor behind you, try not to bend the elbow. Take a few deep breaths while in this position, bring the arm back down to your side. Move the ball down so that it is underneath the second rib and start the process over. Do this with each rib. Spend 6 minutes working the ribs on your right side and then 6 minutes on the ribs on the left side of the body. 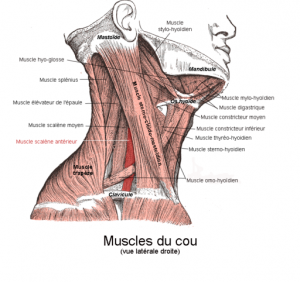 The scalene muscles are a group of muscles located on either side of your neck. They are responsible for bringing your head forward and down toward the chest. When the scalene muscles become tight, they can cause pain in the back of your neck, the chest and arms. Fix a strap or a resistance band to steady object (like a door knob) at chest level. Grab the strap with the right hand. Position the right hand behind the back so that the upper arm is by your side, the elbow is bent and the fore arm is again the back of the waist. Create tension with the strap to hold your right arm in position. Drop your left ear toward the left shoulder. Relax into the stretch for 30-60 seconds. Maintain the stretch as you gently turn your chin up so that you are looking at the ceiling. Relax into the stretch for 30-60 seconds. The scalene muscle stretch will increase the flexibility of the front of the neck. It is important to keep the body balanced so, you should also stretch the back of your neck. Try this simple stretch that you can even do at your desk. Sit comfortably in a firm chair. Clasp your hands behind the back of your head. As you press down, use the heels of your palms to pull your head away from your shoulders. Hold for at least 30 seconds, and then slowly lift your head up and release your hands. These three exercises will help you reduce neck stiffness and can prevent it from coming back. It is well worth your time to stretch in order to avoid a pain in the neck!